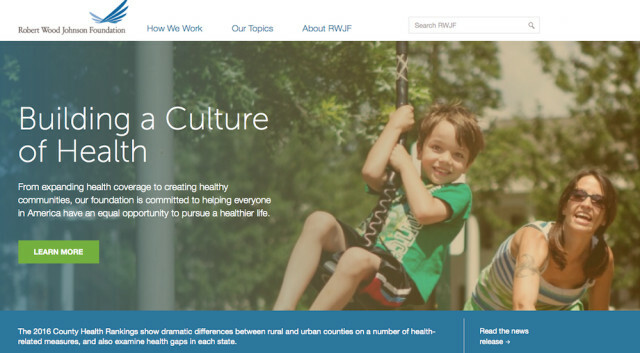 For the second consecutive year, Sarasota County was ranked third in the state in the Robert Wood Johnson Foundation report of Florida health factors, the Florida Department of Health in Sarasota County (DOH-Sarasota) announced on March 16. Among Florida’s 67 counties, Sarasota was ranked second for quality of life measures; third for clinical care factors — the number of primary care physicians, for example; and fourth for health behaviors, including the percentages of adults who smoke and those who are obese, the report shows. One statistic that has improved over the past year pertains to mental health. The 2016 report notes the ratio of county residents to mental health providers at 560 to 1. The 2015 figure was 600 to 1; in the 2014 report, it was 700 to 1. On a less positive note, the county was listed at 12th for social and economic factors, including the number of children in poverty: 19 percent, though that was down slightly from 20 percent in the 2015 report and 22 percent in the 2014 data. The statewide childhood poverty rate for the 2016 rankings was 24 percent, the report shows. Top U.S. performers had an average rate of 13 percent, the report adds. 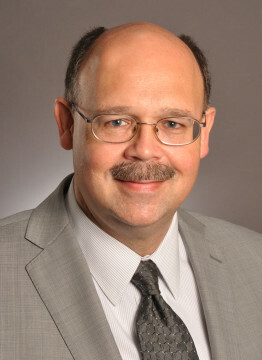 The Executive Summary of the Sarasota County Schools’ 2015-16 budget says that since the economic downturn began in 2007, the percentage of district students who meet the requirements for participating in the free and reduced-price lunch program has increased from an average of 41 percent to 51 percent. It adds that in 2015, to qualify for free meals, a family of four could not earn more than $31,005 a year; for reduced-price meals, a family of four could not earn more than $44,123 yearly. Additionally, the 2016 report says 35 percent of the county’s children were living in single-family households, though the state average is 38 percent. In regard to the physical environment, Sarasota County ranked 10th in the state. Among factors cited in that category were the number of people who drive alone to work (83 percent, up from 82 percent the previous year and 81 percent in the 2014 study); and those with severe housing problems (21 percent; unchanged from the 2015 and 2014 reports). However, the report did note that Sarasota County had no drinking water violations. Among other positive factors, the data show only 3.3 percent of residents reported poor physical health days and only 3.8 percent reported poor mental health days. Additionally, just 12 percent indicated they were in poor or fair health. In regard to health behaviors, the report says 14 percent of Sarasota County adults are smokers, while 21 percent of them are obese. The comparison averages for the state were 16 percent and 25 percent, respectively. In the 2015 report, 19 percent of county adults were smokers, but the obesity percentage was the same. Ninety-five percent of county residents have access exercise opportunities, the report says; the state average is 92 percent. Among the Clinical Care data, the report notes that 23 percent of the county’s population has no health insurance — unchanged from 2015 and 2014. The ratio of residents to primary care physicians in the 2016 report is 1,300 to 1; for dentists, it is 1,450 to 1. In the 2015 report, the ratio of people to primary care physicians was 1,266 to 1; the figure for residents to dentists was 1,441 to 1. 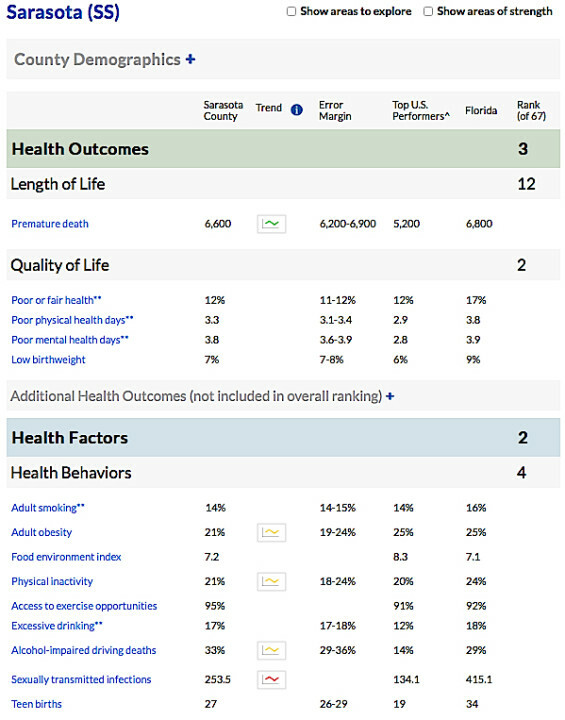 The DOH-Sarasota news release notes, “This study is the seventh in a series of annual reports highlighting the many community factors influencing health and measures progress using established data sources,” and many are available from the department at www.floridacharts.com. “The report reinforces the benefit of community collaborations since health and well-being is not the result of one single effort but rather the dynamic achieved through the collective and ongoing efforts of many community partners,” the release points out. Among those, it says, are local governments, nonprofit organizations, healthcare facilities, business groups, schools and faith-based organizations. Manatee County ranked 24th overall in the Foundation survey, while Charlotte County was 15th. For more information about the 2016 County Health Rankings, visit www.countyhealthrankings.org.